One might have expected some progress from the 650D’s new APS-C hybrid sensor with respect to its predecessor, but with a DxOMark Score of 62, the EOS 650D has fallen behind the 600D by 3 points. The comparative dynamic range curve at different sensitivities shows a slight drop for the EOS 650D culminating at 1/3EV below the EOS 600D. This is not a perceptible difference, but certainly shows movement in the wrong direction. The signal-to-noise ratios of the two cameras are similar. This holds true as well for other Canon cameras equipped with 18 Mpix sensors: the Canon EOS 550D achieved a DxOMark Score of 66; the 15 Mpix EOS 500D took home 63 points … the same identical score as for the EOS 650D. Despite the lack of progress in this area, Canon nonetheless decided to endow the EOS 650D with the possibility of shooting at 25600 ISO. The EOS 650D most assuredly brings with it several pluses over its predecessor — new features such as its hybrid autofocus and touchscreen. But Canon’s “new” sensor has not made any significant progress with respect to the 600D in terms of sensitivity and dynamic range, so as far as image quality goes, this camera simply maintains the status quo. Color depth: A difference of 2.4 bits, which corresponds to 1.6EV. Dynamic range: The Nikon sensor provides 2EV more dynamic range than the Canon. The progress of the EOS 650D’s sensor stagnates under 800 ISO, whereas Nikon D3200’s continues to grow, achieving an excellent score of 13.2EV. Low-light sensitivity: The Nikon D3200 drives the final nail into the coffin on this point, with a lead of just over 0.5EV — difficult to see on a print, but the difference is there and constitutes an advantage for the Nikon with its higher resolution (24 megapixels vs 18 megapixels). The Canon EOS 650D sensor is also outpaced by the 16 Mpix sensor of the Nikon D5100, which shows a difference 18 points on the DxOMark overall score… produced by the same differences in performance as the D3200 for color depth, dynamic range, and sensitivity. When compared with the Sony SLT-A65, the Canon EOS 650D reduces the gap it experienced when pitted against the Nikon cameras, this time showing “only” a 12-point deficit vs the Sony. The Sony SLT-A65 is well-positioned to take on the EOS 650D. The two cameras provide the same low-light sensitivity, but we know from having tested various types of Translucent Mirror Technology that such systems usually reduce low-light scores by about 1/3 to 1/2EV. The SLT-A65 does in fact divert a portion of incoming light to support its electronic viewfinder, and… this is pretty much the only reason that the 650D can compete with Sony’s DSLR video in terms of low-light sensitivity. The Sony camera beats the Canon in dynamic range. Dynamic range tells a very different story, with the Canon falling behind the Sony by 1.4EV. And as for color depth, the Sony beats the Canon by one stop. 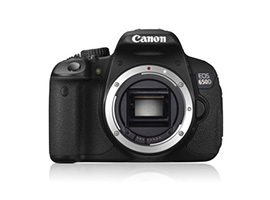 Announced this past June, the Canon EOS 650D continues with the winning formula found in the EOS 600D: a compact, light-weight camera — but now endowed with several well-designed features such as an articulated, capacitated touchscreen display (standard equipment on three other Canon amateur SLR models). But on the sensor side, no outbreak of pixels here: the 650D uses the same 18 Mpix APS-C CMOS sensor that Canon has used in this line since 2008. However, the 650D’s sensor has been “hybridized” to enable contrast detection autofocus when in video mode. In principle, this new feature should be accompanied by better sensitivity and a broader dynamic range.